Woo-hoo! JC and I became critique partners after Free Agent’s reads were complete, so I have looked forward to the start of Marissa’s story, especially after reading the next two installments. This urban fantasy is a wild ride of twists and fairytale problems! 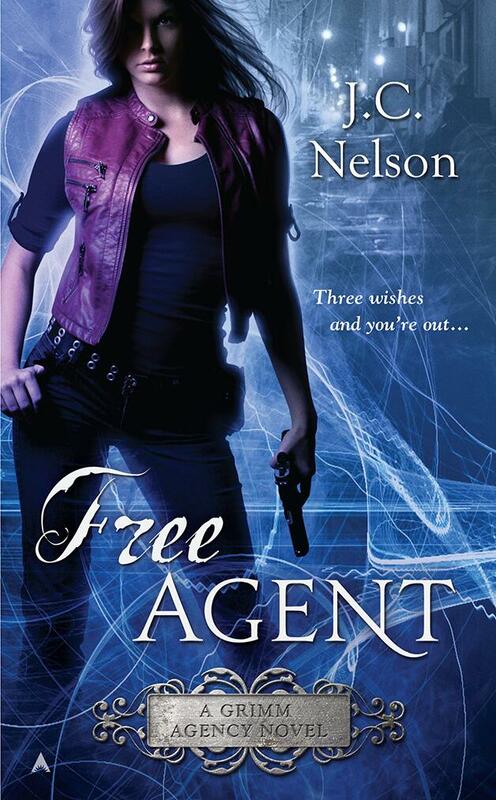 On release day only, JC is offering a Rafflecopter giveaway of 1 Signed Print copy of Free Agent, 4 electronic copies of Free Agent. Want to read a chapter? Here’s the first! The New Year’s Eve countdown told me I had five minutes until the ball drop. That gave me six minutes until somebody got killed. I spotted the shoplifter in line at the theater and worked my way across the street, through the teeming crowd. She had no idea what she was wearing, which made her both stupid and dangerous. Stupid was dangerous enough by itself. “Marissa, I might remind you of the time,” said a man’s voice. It came right out of the store window beside me, the dry voice with its not-quite-English accent. He watched me with critical eyes. “I got it, Grimm.” I walked along the theater line, head down. Call it women’s intuition, or maybe the slippers she wore tipped her off, but the shoplifter turned and looked right at me. Our eyes met, and she knew why I was there, if not who I was. As the crowd surged forward, she ducked into the theater, disappearing into the throng. The Romance Writers of America National Conference is this week and I’m looking forward to workshops, the trade show, meeting with friends, and especially finding new books.